This is a nano cache, tweezers may be useful. Great-Harwood, in the hundred of Cotslow and deanery of Muresley, lies about two miles north of Winslow: it had formerly a market on Wednesdays, granted in 1447 to New-College, in Oxford, together with a fair for three days, at the festival of St. James.The manor was given by Walter Giffard, Earl of Buckingham, to the priory of Newton-Longueville; on the suppression of which, in 1415, it was granted to John Duke of Bedford: reverting to the crown at his death, it was granted in 1441 to the wardens and scholars of New-College, in Oxford, who are patrons of the rectory. In the church are some memorials of the family of Barker. 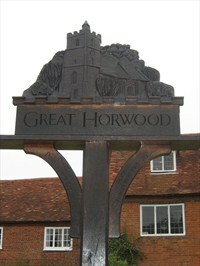 Derivation of the name "Horwood"
The name Horwood derives from the old english words horh, wudu, and means 'filthy' or 'muddy wood'. The name Great being used as a distinguishing affix. surrounding towns of Aylesbury, Milton Keynes and Buckingham. Some residents commute into London using one of the two train lines. Trains from Milton Keynes arrive at Euston, whilst trains from Aylesbury terminate at Marylebone. The village sign is a hand carved wooden sign and stands in the middle of the village green. It depicts the nearby church. This cache is a magnetic micro with no room for a pencil or swaps (I know, another micro. I am sorry but it was the only size that I could hide in the area). It is a few meters from the village sign and due to the fact that this location is so open and over looked stealth will be required. Please be careful to place back exactly where you find it. fvg qbja naq nqzver lbhe fheebhaqvatf.